The 60W foldable solar charger takes you to the next level in portable solar power generation, increasing capability and charging speed while weighing just more than 3 lbs. The 60W foldable solar charger provides you with a step-up in power point for solar charging medium to large electronic devices directly using the DC power or by utilizing one of many available accessories. 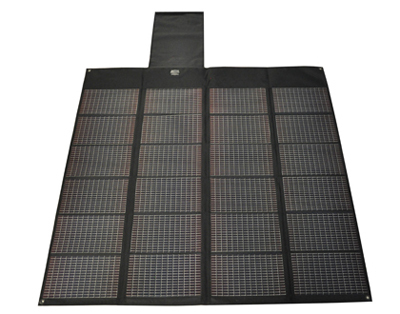 Unmatched durability allows for use in even the harshest environments and PowerFilm’s proprietary processes produces a panel that works even after being punctured.Unlike "CIGS" solar technology, there is no need for "sun-soaking" the panel for optimum performance after periods of storage - so PowerFilm solar provides critical power immediately.